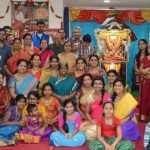 With boundless grace of Sri Swamiji, Madhura Utsav and Bhakti yoga lecture series of our beloved Sri Ramanujamji was grandly celebrated from December 9th to 12th 2016 at Virginia Namadwaar. The first day started with Prabodhanam and Mahamantra Nama Sankirtan at Namadwaar. 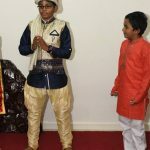 Later, Parayanam of Srimad Bhagavata Mahathmiyam was recited and Madhura Geetham were rendered as a part of Sri Swamiji Sampoorna Madhurageetha Mahayagnam. Sri Ramuji concluded the satsang with aarthi and lunch prasad was served. 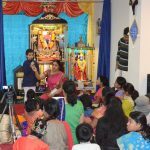 Around 5pm the Gopakuteeram kids gave pravachans/short lectures. 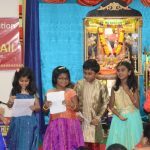 The older children spoke about the life history of Jayadevar, Adi shankara, Kanakadasa, Andal and Sri Ramanujar. 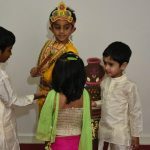 The younger kids narrated the Govardhana leela and Dhamodara leela. 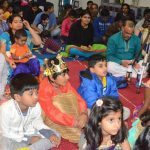 Following the children’s program Sri Ramanujamji commenced his divine lecture on Bhakthi Yoga (Chapter 12 of Bhagawad Gita) which was enjoyed by many devotees. 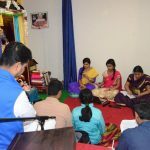 Krishna Janananm chapters from Srimad Bhagavatam tento canto was recited after the lecture and Krishna’s birth was celebrated with Krishna Avatar Madhura Geetham songs. The first day concluded with Dolothsavam and dinner prashad was served. 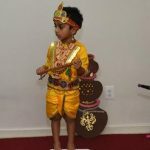 The second day of the Madhura Utsavam, following prabodhanam at Virginia Namadwaar, several devotees participated in the ‘Srimad Bhagavatha Dasama Skanda Parayanam’ and in the rendition of Madhura Geetham. At noon, Sri Ramanujamji performed the Govinda Pattabhishekam, offering Anna koot and Rajbhog/Chappan seva to the lord. Following that, Indra sthuthi from Srimad bagawatham was recited by Rithwik and Govinda Pattabhishekam keertans were sung by the devotees. 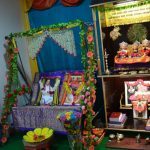 The divine presence of the Lord was felt as all the devotees chanted the ‘Govinda’ Nama and Pushpaabishekam was done to the Lord. 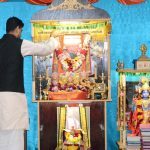 Sri Ramanujamji gave a short lecture on Govardhan Leela and concluded the morning Satsang with Aarti and Lunch Prasad was served.It was Gita Jayanti as well on that day. So after lunch there was a complete Parayanam of Sri Bhagavad Gita. 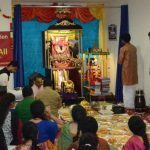 All the devotees felt blessed to chant Gita on ‘The Gita Jayanti day’. Evening program commenced with the dance drama play ‘Navarasas’ in Krishna Leela, by the Poorna Vidhya Heritage students from Maryland. It was a wonderful play depicting all the Navarasas like anger, surprise, disgust etc from Krishna katha. The play was followed by Nikunjothsavam, and a captivating vocal concert by Kum. Ajitha Bala accompanied by Chi.Somnath Dandibotla on the violin and Chi.MVK Sandilya on the Mridangam. Ajitha’s mesmerizing voice and her perfection in rendering the Kritis captivated the audience. She was well supported by her accompaniments. 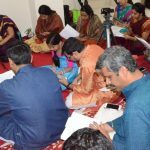 The feast to the ears continued with Sri.Ramanujamji’s lecture on Bhakti Yoga. 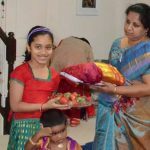 He concluded the day’s Satsang with Dolothsavam and Aarthi. Dinner Prasad was served. 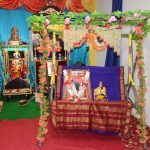 On the third day of the Madhura Utsavam, Rukmini Kalyanam was celebrated at Namadwaar. 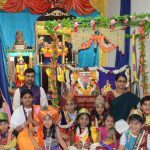 Following Prabodhanam, Srimad Bhagavath Dasama Skanda parayanam continued. 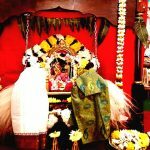 At around 10:30am, Rukmini Kalyanam was celebrated with Thodaya Mangalam, followed by Ashtapatis, Tharanginis, Oonjal songs and, Madhura Geetham. Then all devotees repeated the Pravaram and Choornikai which then concluded the Kalyanam at around 1pm. 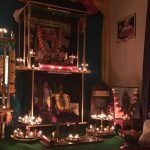 At 5pm, devotees rendered Madhura Geetham as a part of the Madhura Geetha Mahayagna. 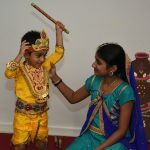 Afterwards, the Virginia Gopakuteeram kids staged a play on Krishna’s Leelas, featuring the Damodhara leela and Govardhana leela. 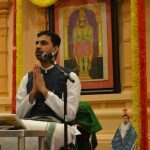 At 7pm Sri Ramanujamji continued his lecture on Bhakti Yoga. This was concluded with Dolotsavam and Arthi. Dinner prasad was served. 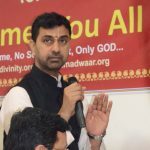 It was Monday, Day 4 of Madhura Utsav. The morning Satsang started with the Prabodhanam. Later fortunate devotees had a Nama Dhyan session led by Sri Ramuji. Later In the evening, more Madhura Geethams were sung as part of the Mahayagna. December 12th being the fourth day of the Utsav was very auspicious indeed as it was Annamalai Deepam as well. 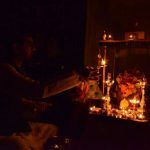 Devotees lit the lamps and Aksharamanamalai was recited to Sri Swamiji’s Holy Padhukas. 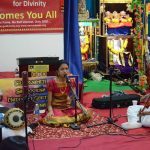 Relevant Madhura Geethams were also sung. It was followed by the Anjaneya Utsav. 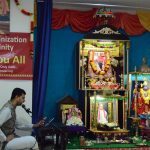 Hanuman Chalisa was recited 3 times and Hanuman keertans were also rendered. Vadamaala was offered to Lord Anjaneya. The utsav was concluded singing the “Anjaneya Anjaneya Rama” keertan and aarthi. Then Sri.Ramanujamji continued his nectarine lecture for the 4th day. Chapter 12 from Sri Bhagavad Gita was also recited. 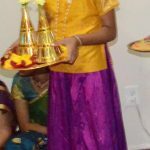 The Satsang concluded with Dolothsavam and Aarthi. Dinner prasad was also served. 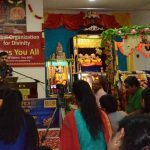 Day 5 lecture was at Sri Bhakatha Anjaneya temple at Maryland. 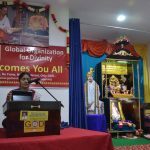 Since it was a Rohini star day, Sri Ramuji gave a lecture on “Sri Krishna Jananam”. This was well received by many devotees. 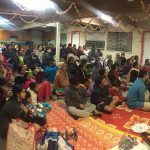 The whole Utsav was attended by around 200 fortunate devotees. 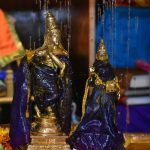 With Srimad Bagavatha parayanam, Madhura Geetha Mahayagnam, Nandothsavam, Govinda Pattbishekam, Anna Koodothsav, Raj Bhog, Nikunjothsav, Rukminikalyanam and above all the nectarine discourse, immersing us in Bhakthi Yoga – Bhagavatha Dharma, it was a treat to relish! 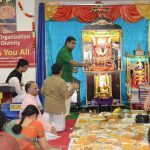 While bowing down to Sri Swamiji, Thakurji and Sri JagannathJi for their causeless mercy, Virginia GOD Chapter express their sincere gratitude to Sri Ramanujamji for compassionately sharing the divine nectar of Bhakthi yoga- Bhagavatha Dhrama. 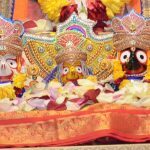 His presence throughout the Utsav augmented our bliss. 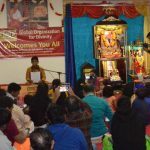 Heartfelt thanks to our Satsang families, friends and volunteers from Richmond and other states, from California, Boston, Maryland, New Jersey, North Carolina and, Washington DC, whose contributions and service made this Utsav a grand success. It is such a great effort by all out of state satsang families by taking time out of their busy schedule to come to Richmond by road or taking multiple flights to attend to grace the occasion, offering their support, kainkaryams and contributions, it made u everyone speechless. It was such a joy and bliss being with Sri Ramamujamji and celebrating the Utsav with him and listening the nectarine lectures for the past five days. Virginia GOD Satsang families truly miss Sri Ramanujamji and his satsang. 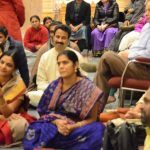 Now all of us “the Govindan’s family ” will continue chanting Nama, eagerly looking forward to our next grand Utsav in 2017! !